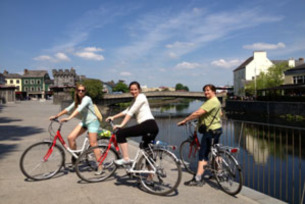 Kilkenny Cycling Tours offers you the opportunity to visit historical and cultural sites, including Kilkenny Castle, The Design Centre, Shee Alms House, The Tholsel, The Butterslip, Rothe House, The Old Courthouse, Saint Francis Abbey, The Black Abbey and Saint Canice’s Cathedral. Kilkenny Cycling Tours offers you the opportunity to explore the very best that medieval Kilkenny City and County has to offer. Experience great Irish hospitality while having an enjoyable easy-paced cycle around the medieval capital of Ireland. Book your tour with Kilkenny Cycling Tours today contact us online to make a reservation or contact us by mobile and we will meet you at the your hotel or another convenient pre arranged place. The tour is two hours approx and can be shortened or extended to suit all ages. There are 3 tours per day in the summer. It is a fun and environmentally friendly way to see all the attractions if you are only visiting for a short period. The tour is very easy going with no hills and is suitable for all ages. We have over 50 bikes all different shapes and sizes to choose from. Child seats, Tow-alongs, Road Racers, Off Road Mountain Bikes and Hybrid Town Bikes. The tour is very popular with families,youth groups,Hens and Stags, couples and corporate. Bike and Hike Cycle from Kilkenny city to scenic Bennettsbridge leave your bike in Bennettsbridge and hike back on the Nore Valley Riverbank trail. Maps and safety equipment provided. Free collection and delivery of your bikes 10km in both directions. We cycle along the river paths and stay away from traffic. Visit historical and cultural sites, including Kilkenny Castle, The Design Centre, Shee Alms House, The Tholsel, The Butterslip, Rothe House, The Old Courthouse, Saint Francis Abbey, The Black Abbey and Saint Canice’s Cathedral. Other Tours on request. Bikes can be delivered to the customer's accommodation, free of charge.